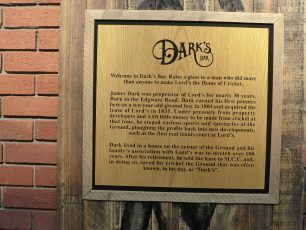 James Dark was involved with Lord’s for 59 years. He was born on 24 May 1795, the son of a saddler and lived close by the ground in St John’s Wood. He was a professional cricketer of some success, appearing for the Players in the match versus the Gentlemen in 1835. He was a good batsman and fielder, acting intermittently as a wicket keeper, and later an umpire. 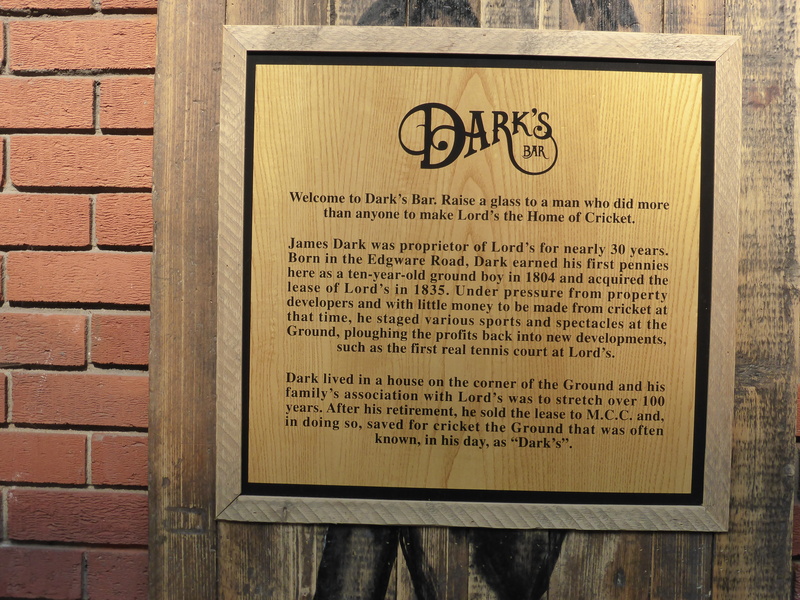 Dark used his earnings as a cricketer to become a property developer. Thomas Lord opened the current ground in 1814 on land leased from the Eyre estate. His original plan to develop the ground with houses was opposed and in 1825 he sold his leasehold interest to William Ward for £5000. Ward sold the leasehold on to Dark in 1835, for an upfront payment of £2000 and an annuity of £435 to the Ward family on Michaelmas Day each year. James Dark offered his services to the MCC and did much to improve the ground, refusing all payment. There were two ponds on the land and he carried out the draining of them and the levelling. At that time sheep were used to keep down the grass. The pavilion was improved and gas lighting installed, a billiard room was added and the real tennis court. He also planted 400 trees. He staged many events at Lord’s. 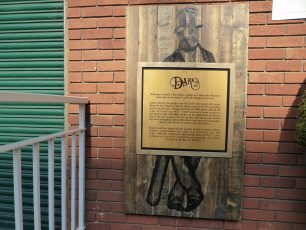 Dark was known as “the Boss” and did not have an easy going personality. 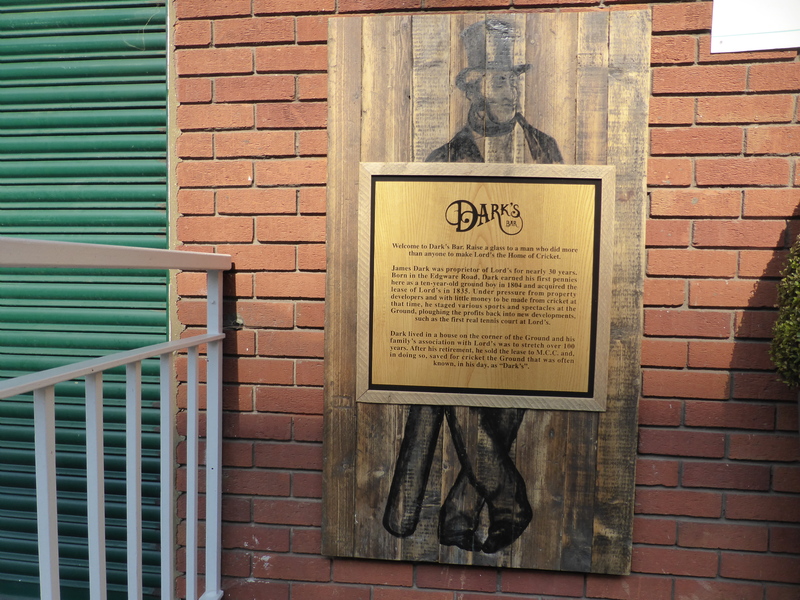 Dark’s brother Benjamin set up a bat making business at the ground and another brother Robert, sold cricket equipment such as the new pads and gloves. The family association with Lord’s stretched over 100 years. In 1860 the Eyre estate decided to sell the freehold at auction. The MCC were urged to bid but would not, and the ground was bought by Isaac Moses, a property speculator, for £7000. Dark resigned the leasehold in 1864 and it was taken over by the MCC. In 1866 William Nicholson provided funds for the MCC finally to buy the freehold from Isaac Moses, which now cost them £18,333 6s 8d! James Dark died on 18 October 1871 aged 76 and is buried in Kensal Green Cemetery. This page was added on 27/06/2016.